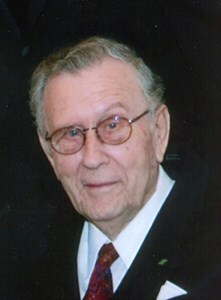 Green Bay - John W. Peterson, 93, passed away peacefully due to heart ailments and Dementia. He was born March 27, 1925 near Embarrass, WI to James and Marie (Brandt) Peterson. John graduated from Clintonville High School. On October 19th, 1946, John married Lorraine Meyer in Milwaukee, WI and shared the next 62 years of loving life together before she passed of Alzheimer's. John was employed at FWD Corp, Clintonville until he took over the family farm for 9 years. John and family moved to Omro, WI, where he was employed 11 years by Badger Breeders Corp in Omro and then Clintonville. In 1966 he became a Driver License Examiner for the State of Wisconsin, earning his nickname as "No Pass" Peterson, until he retired in July of 1989. From teenage years until his mid 80's, much of his spare time was spent hunting and fishing. He also loved to travel and camp across the United States with Lorraine and the boys. After retirement John and Lorraine did much traveling with the Avion Travel Club from Mexico to Canada and a 3 month tour to Alaska. After Lorraine's passing, the house had become too empty and lonely. John married Kathleen Wagner in November of 2010. She filled the emptiness and was a loving companion until the end. John will be missed by his two sons Douglas (Adrianne) Peterson, Wrightstown; Dennis (Wanda) Peterson, Ashwaubenon; four grandchildren Bradley Peterson, Nathaniel (Rebecca) Peterson, Jonathan (Desiree) Peterson and Penny (Chris) Schultz; and nine great-grandchildren. Preceded in death by his father and mother, James and Marie (Brandt) Peterson, wife Lorraine (Meyer) Peterson, and his sister Leona (Peterson) Scott. John loved the Lord, his family, his church family, friends and neighbors. "I have fought a good fight, I have finished the course, I have kept the faith. Henceforth, there is laid up for me a crown of righteousness, which the Lord, the righteous Judge shall give me in that day, and not to me only, but, unto them also that Love his appearing." 2 Timothy 4:7-8. Visitation will be held at Meadowbrook Church, 701 Hillcrest Heights, Howard, on Saturday, February 9, 2019 from 10 AM - 12 PM. A funeral service will follow at 12 PM in the church. Add your memories to the guest book of John Peterson. Sorry to hear of your dad's passing. He was a funny guy and we have good memories of he and your mom. Hope your good memories will help you through this difficult time. We are in Florida and will be unable to attend John's services. Please know that you are in our thoughts and prayers at this time.